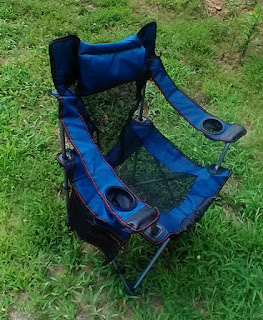 Have you ever gone fishing or camping and didn't bring a chair? Or the chair you had was heavy and miserable to carry? I found a good solution for both issues, Lightweight Reclining Camping Chair by RORAIMA. 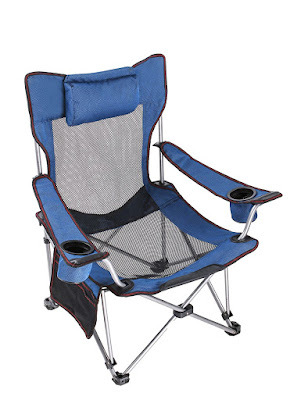 This chair weighs only 11 lbs., so you can easily take it with you anywhere you go. It's perfect to take camping, fishing to the beach, the pool,or a game, RV or BBQ. This chair comes with a carrying bag to make bringing it with you even easier. The chair measures L34" X W22" X H15" and holds up to 200 lbs. You can change this standard chair to a recliner easily, just be sure to carefully follow the directions the first time you use it. Made from durable Oxford material with strong mesh support , it's well ventilated for hot summer camping and dries quickly after swimming or other water sports. This chair has left and right side cup holders, an extra headrest, and a mesh pocket to store your wallet, phone, tablet or other personal belongings.I think a lot of thought went into the design of this chair. This company had your comfort and the safety of your belongings in mind. There are so many uses for this chair, and you don't have to be limited to only using it outdoors, it's perfect for sitting on your patio or taking to an open party. I have to say, it is comfortable to sit in, I really like the extra headrest. Now I can sit and watch a whole football game or sit for hours fishing and be comfortable doing it. I feel good about owning this chair, as with all RORAIMA products, it has a lifetime warranty. That says a lot about a product when a company backs it with a lifetime warranty. I bought this product at discount to facilitate this review.